This enormously popular assortment of area rugs is inspired by Kathy Ireland's travels all over the world, and has a relaxed feeling that reflects Kathy's enjoyment of family life. Kathy Ireland's area rugs are stunning, durable and machine made of lush 100% polypropylene in a Wilton woven construction. Available in a wide selection of fashionable sizes, including oversized and round styles, as well as runners, all area rugs in this collection present maximum flexibility and unparalleled value. Comfortable, attractive, and "touchable," the selection of designs and fresh colors of this collection make decorating simple. Kathy's family oriented way of life is reflected in Young Attitudes, an exhilarating collection of children’s rugs made to hold up to the active lifestyle of today's families which are great interior design solutions and a astonishing value. Woven rugs are made of 100% polypropylene, and printed rug designs are constructed of 100% nylon. Fun, fanciful designs and trendy, exciting colors make these perfect accent rugs in any room for the kids at heart. The stress-free styling of Kathy Ireland Home Aloha combines coastal images and sun-drenched colors to convey an exotic ambience into any room of your home. Palm trees, sea shells and other tropical designs cordially invite friends and family to come take a seat and relax. These woven patterns are made of 100% olefin and are available in six standard sizes. 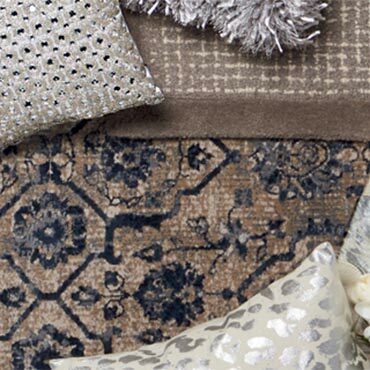 This grouping also includes natural fiber area rugs with traditional cotton accent binding. Kathy Ireland's faith that every woman deserves to be the First Lady in her own home is strikingly realized with First Lady, her finest quality area rugs ever. The distinctive feel of Shaw’s EverTouch™ nylon is extraordinarily soft, shimmering and durable. Instant classics, First Lady area rugs offer enduring styling, superb detail and extraordinary texturing. The lovely hand-sewn Quilts of Gee's Bend are celebrated across America. Each is a work of modern art, designed by artists of the Gee's Bend collective in rural Alabama. The craftsmanship of these gorgeous quilts has been handed down through six generations of women. Now Shaw Living and Kathy Ireland are proud to bring these designs, which are made with great artistry, respect and love into American Homes. Woven of soft, gleaming olefin, the Quilts of Gee's Bend area rugs feature a buttery soft hand, radiant colors, and a carved, hand sculpted appearance. The collection features seven striking area rug designs that blend traditional African American inspired patterns and bright hues with a modern, abstract feeling. Innovation has long been a trademark of the Kathy Ireland Brand and today that originality is wonderfully translated into her latest rug collection, Innovations. Celebrating many styles from Modern and Geometric to Organics and the American West these rugs boldly invite friends and family to get together and spend time. Innovations area rugs are made of lustrous olefin. The buttery-soft, heavy hand carved, sculpted appearance that you can see and feel make these rugs great design solutions. Jardin du Jour, Jardin del Dia, Garden of the Day Cultivated by Landscape Designer Nicholas Walker, is Kathy Ireland's dedication to developing area rugs for summer homes, sunrooms, screened-in-porches, patios and any other living space associated with the outdoors. The blue, white, and yellow printed nylon rug designs, and the machine woven olefin designs are for interior spaces. The Natural Bamboo rugs (with polyester binding) can be used indoors or outdoors.